Thousands of police and soldiers stand at attention during a send off ceremony and deployment to provide security for next week's ASEAN Summit and other related summits which the country is hosting in Manila, Philippines Sunday, Nov. 5, 2017. U.S. President Donald Trump's extra day of participation at a major Southeast Asian nations' leadership event next week will help lift his image among counties where officials are unsure about what he plans to do in a region that’s increasingly dominated by China, analysts say. Trump will extend his stay in Manila through Nov. 14 for the East Asia Summit, according to news reports from Washington. That event brings together 18 heavyweight leaders from the region of more than 4.5 billion people, including heads of state from China, Japan and Russia. Analysts say the appearance will send a message that Washington cares, at least symbolically, about Asia. Asian leaders have waited since Trump took office in January to start any trade negotiations that would replace the U.S. withdrawal from the 12-country Trans Pacific Partnership and clarify whether he will pursue a freedom-of-navigation policy in the disputed South China Sea despite opposition from China. “If he can attend the East Asia Summit, that will send a strong signal to the region that the U.S. and especially the Trump Administration remain committed to this region and it can boost the morale,” said Le Hong Hiep, research fellow with ISEAS Yusof Ishak Institute in Singapore. The 12-year-old East Asia Summit lets major players from Asia and the Pacific discuss top issues. Last year, for example, leaders issued a statement of commitment to a U.N. resolution that bars “non-state actors” from getting weapons of mass destruction. Leaders from Australia, China, India, Japan, New Zealand, Russia, South Korea and the United States normally attend alongside the 10 Association of Southeast Asian Nations (ASEAN) countries. While in Manila, Trump will probably make broad statements of reassurance rather than firm commitments, said Trung Nguyen, international relations dean at Ho Chih Minh University of Social Sciences and Humanities. Trump is often compared in Asia to his immediate predecessor Barack Obama, whose “pivot to Asia” included diplomatic, economic and military support. His government held joint naval patrols with the Philippines and lifted a U.S. ban on selling lethal weapons to Vietnam as the Southeast Asian countries faced ever-tougher rivalries with China. Trump has suggested that bilateral free trade agreements with the United States, a major export destination for countries from Japan through Indochina, could replace the Trans Pacific Partnership. 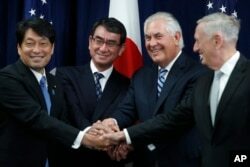 But in Asia U.S. officials have ostensibly pushed for trade liberalization talks only with Tokyo. Japan, Malaysia, Singapore and Vietnam were the partnership’s Asian members. Four Southeast Asian countries that vie with Beijing for claims to the resource-rich South China Sea may also hope for a boost from the U.S. government, Le said. China has irked Brunei, Malaysia, Vietnam and the Philippines since 2010 by passing coast guard vessels through their maritime economic zones and building artificial islands for possible military use. 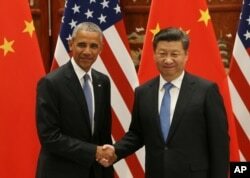 China described Obama’s pivot as a way to contain Chinese expansion, but his government helped Southeast Asian countries balance their foreign policy between the two superpowers. U.S. President Barack Obama, left, and Chinese President Xi Jinping shake hands at the West Lake State Guest House in Hangzhou, China, Sept. 3, 2016, on the sidelines of the G-20 summit. Trump’s government occasionally sends naval vessels to the 3.5 million-square-kilometer sea to remind China it’s open to all, but experts say those moves fall short of the consistent policy much of Asia wants. “I’m happy to hear President Trump’s staying the extra day in Manila for the ASEAN East Asia Summit but I’m not sure how much good it will do,” said Sean King, vice president of the Park Strategies consultancy in New York. Over the past two years China has followed maritime expansion with aid and investment in the countries that dispute its claims as well as across much of the continent, part of a strategy it calls “One Belt, One Road.” Other Southeast Asian countries, such as Cambodia and Laos, were already receiving that kind of assistance. China now beats other potential benefactors in offering highways, railroads and electricity plants in the region, said Alan Chong, associate professor at the S. Rajaratnam School of International Studies in Singapore. Beijing may expect those countries in return to allow passage of Chinese naval vessels, he said.